The intention of Constanze’s project was to expose the Canadian audience to a visualization of European electronic and deep house music. To do this Constanze created a coin-slot interface that selects from one of 10 music tracks. For each track Constanze created a custom light design using 148 individually addressable multi-color LEDs. The LEDs are refracted through glass jars and bottles to create complex and beautiful patterns that move in sync with the music. Enjoy! 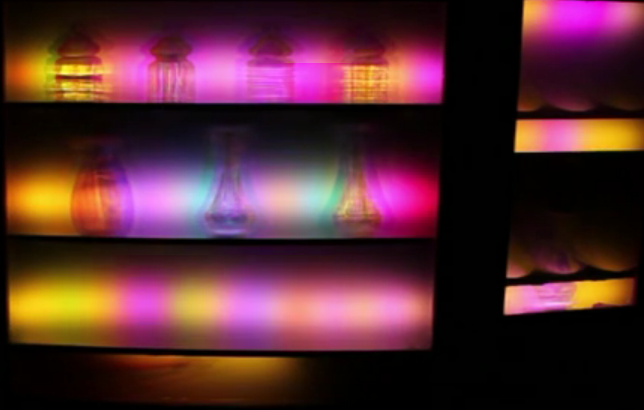 Interactive Light Bar from Limbic Media on Vimeo.